Home — Glamping in south Wales, UK. Dog friendly glamping site. Croeso/Welcome to Carmarthenshire. East Carmarthenshire is where you will find Wild Mountains site. It is filled with castles, myths, legends, beautiful gardens & countryside. This is pages is designed to give you some details on what you can get up to whilst you are visiting this little lesser known part of Wales. Llandelio... is named after one of the Celtic Saints of the 6th century, Saint Teilo. The Welsh word llan signified a monastery or a church. Saint Teilo, who was a contemporary of St David, the patron saint of Wales established a small monastic settlement on the site of the present-day parish church. 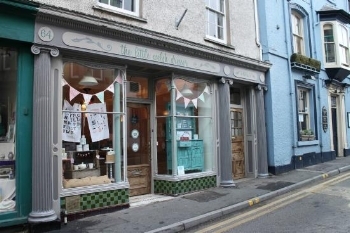 Llandeilo is probably more well known for it's independent boutique shops, deli's, butchers, ice cream makers, fashion outlets and antique retailers. It's a definite stop off for a little bit of retail therapy and bite to eat. 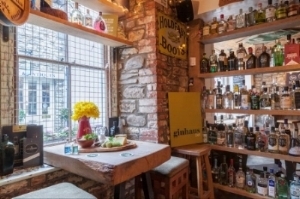 Ginhaus: A lovely little deli with lots of local Welsh produce, great homemade cakes, fresh bread and fabulous eats. As the name suggests they specialise in gin, local and from around the globe. We recommend trying Dà Mhìle gin, distilled in Ceredigion, we especially like the seaweed gin with Fevertree's Mediterranean tonic. 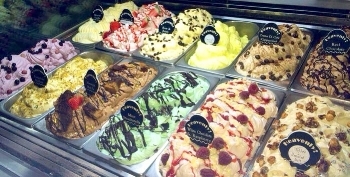 Heavenly Ice Cream & Cakes: Great for anyone with a sweet tooth, try their award winning Aberglasney Lavender Ice-Cream. 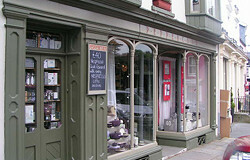 The Cawdors: The distinctive red building can't be missed on the main street through Llandeilo. The hotel dates back to 1765 and is very popular with guests from far afield and close by. With an atmospheric bar and lovely restaurant and cafe, it's ideal for an upmarket meal or a just for a glass of something chilled. The Hangout: Funky and cool little brunch place, get your coffee, bacon sarnies and cake here. Peppercorn: For all want to be chef's, Peppercorn has everything you need. Toast: Originated in Llandeilo, the Toast brand now has stores all over the UK but it's ethical ethos to fashion and quality remains the same. It's also has a great discount section which you don't have in any of the other shops. The Little Welsh Dresser: Perfect for all sorts of Welsh themed, quality gifts for loved ones or just yourself. The Dragon's Garden: Ethical and fair-trade shop, lovely handmade items and clothing. Crafts Alive: A not for-profit co-operative of artists an craft makers. All of the art and crafts for sale are produced by artists that live within 30 mies of Llandeilo. 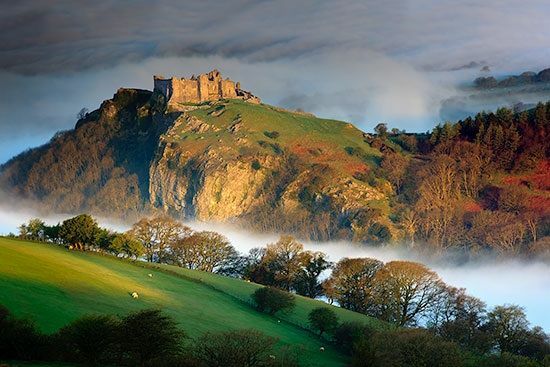 Dinefwr Castle & Newton House: The 12th-century castle of Dinefwr was the centrepiece of the Kingdom of Deheubarth, covering the whole of south- west Wales. the great Rhys ap Gruffydd made it his chief seat, but there was much infighting as well as battles against the English forces and Dinefwr fell into the hands of the English crown in 1277. there is an admission fee to visit Newton House (where the tearoom is also sited), and also for parking. But visitors who come on foot can enjoy the park and castle at no cost. Llandovery... The meaning of the Welsh name, Llanymddyfri, is ‘church or settlement among the waters’. Look at a map and you’ll see why. The Tywi is a river of some strength by the time it reaches Llandovery, where there was a ford even in Roman times. This was and still is a market town. The golden age of Llandovery must have been in the eighteenth century when the drovers brought sheep and cattle here on their way to huge livestock markets in Hereford, the midlands and smithfield market in London. note the drover statue outside the To urist Information Centre. 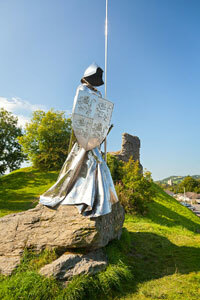 Famous people of the town include Llywelyn ap Gruffydd Fychan who was slain for his support of welsh leader Owain Glyndŵr – the steel sculpture testifies to the drama. The castle was built by the normans from local sandstone. Rhys ap Gruffydd seized it in 1158 and rebuilt it. over the next two hundred years it saw much fighting between welsh princes as well as with the English crown. now only fragments of two towers and some walling remain. Other buildings of note include the tourist information Centre off the car park, full of informative displays, and the King’s head building, a traditional coaching inn which was where the Bank of the Black ox was first set up by drover David Jones. there are two churches, Llandingat built where there may once have been an early Celtic church. Llanfair church is on the site of a Roman camp, so Roman bricks are used in its structure. Note too a fine stained glass window by John Petts. Talley & Cwmdu...Village communities are still at the heart of Welsh life. There is a famous Welsh poem about the forge in Talyllychau, which would at one time have been a hub of the community and culture. Village communities are still at the heart of Welsh life. There is a famous Welsh poem about the forge in Talyllychau, which would at one time have been a hub of the community and culture. This page is designed to give you some details on what you can get up to whilst you are visiting this little lesser known part of Wales. Carmarthen is one of Wales oldest, in the iron age, there were surely celtic tribes in this area and even after the romans came, the Demetae tribe would have kept considerable powers, though they paid taxes to Romans. 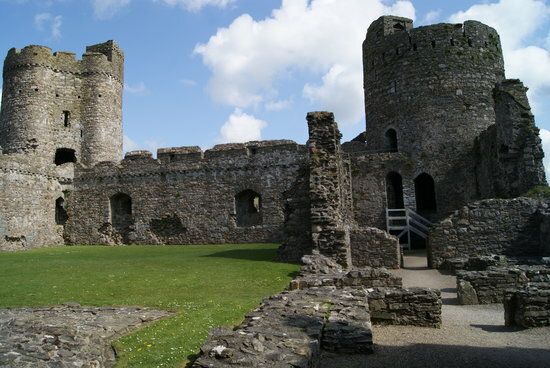 In the Medieval period there was certainly a castle, and much fighting between the English forces and the Welsh princes, the castle being taken first by one side and then the other, for centuries. Visitors should look at the chateau-style county hall built on a bluff above the tywi and just imagine the real castle that once stood there. the remains, such as the gatehouse and one single tower, will suggest how imposing it would have been. there was also a Franciscan friary (under the wilkinson store) and the Priory of st John where the Black Book of Carmarthen was written around 1250. The Black Book of Carmarthen is thought to be the earliest surviving manuscript written solely in the Welsh language, possibly painstakingly copied by one scribe at various times around 1250. it is essentially a poetry manuscript, bound in black and small in size, but full of treasures. Some poems deal with Arthur and Myrddin, known also as Merlin, notably a dialogue poem between Myrddin and Taliesin, a poet who was believed to have prophetic, magical powers. Quite a pair! the manuscript is kept in the National Library of Wales, Aberystwyth.